The fox, observing that the raven plundered the altars of the gods, and that he supported himself from their sacrifices, said to himself: I should like to know whether the raven partakes of their sacrifices because he is a prophetical bird; or whether he is deemed a prophetical bird because he is so insolent as to partake of the sacrifices? The world is always ending in England. In Joseph D'Lacey's new novel, Black Feathers , the world ends in England with a combination of famine, earthquake, and flood. Black Feathers proposes an apocalypse brought about by the exhaustion of the Earth itself, which decides that it can no longer support the billions of human beings who call it home. Therefore, it rids itself of "a giant swathe of humanity, like a dog shaking off fleas" (p. 167), using anything from fissures that open up in the British countryside and swallow whole towns, to mudslides that bury cities. Corporations, seeing an opportunity for profit amid the chaos, unleash a quasi-international mercenary army called The Ward. Their mission is to secure power for the New World Order at any cost. Two children stand in the way of The Ward's plans: Gordon Black and Megan Maurice. The book opens with Gordon's birth, attended by a freak snowstorm and a flock of joyous crows. Unfortunately for the narrative, newborns are not compelling protagonists. His next appearance, at two weeks old, is not much better. Late in the book, Gordon becomes a shy child who is haunted by nightmares, crows, and black feathers that mysteriously appear in his path. He is utterly devoted to his family, despite his father's rages that drive his children to "[cry] their tears as silently as they could, fearing what might come next and not moving in case they caught his attention" (p. 29). Gordon's world is supposed to be our world, perhaps a few years in our future. We see the fall of our civilization through his eyes as his family is destroyed and he begins his quest to find The Crowman, whoever and whatever that might be. Some people hail the Crowman as a savior, while others call him the incarnation of Satan. Either way, The Ward is convinced that capturing Gordon, the "herald of the dark messiah" (p. 142), is the key to ending the Crowman's power. At first, I thought that Gordon might himself be the Crowman, but the book seemed to insist otherwise. Still, I had my suspicions. Whether Gordon himself is the Crowman or just a sign that the Crowman is on his way, the book assured me that Gordon's actions and his fate will determine the fate of humanity—though he seemed to spend all his time running and hiding from The Ward, without ever making any deliberate forward progress until the very end. Megan Maurice is the other protagonist in Black Feathers . She is a girl from the far future chosen by powers beyond her ken to re-live and record Gordon's story, so that it may be retold accurately. Her story somewhat spoils the drama of Gordon's half of the book. Megan Maurice was born many generations after the collapse of British civilization, so the Earth and the human race have obviously survived. Black Feathers insists that she is just as important as Gordon, but the rest of the book fails to support that claim. Her main struggles are to do as she is told and to write down events of Gordon's life that the reader has already seen. Fate, it seems, has made all the hard decisions for her. Despite having lived the first fourteen years of her life as the only child of subsistence farmers, Megan is a frail child. In order to fulfill her destiny, she is apprenticed to Mr. Keeper, the village doctor and wise man. She follows him around as he is "called to accidents . . . as he set bones, bandages sprains or rouses a woman from a faint" (p. 127). Her role is to be a passive receptacle for someone else's life, which does not help to make her story engaging. I found her sections of the book unfortunately dull, both for the constant reminders of how important the other half of the story is and because of her general incompetence. I'm not sure which is worse: the fact that Mr. Keeper puts her on a leash when they visit a town, or the fact that the way she is written makes the leash a good idea. D'Lacey is a successful horror writer, and although I have not read his other books, I can understand why. He has a knack for pain. The sequence in which Gordon crawls through a collapsed tunnel evokes physical human misery with exquisite skill. From the fever-ache in Gordon's bones to the psychological dread of the earth pressing down on Gordon's body, D'Lacey writes a painfully moving picture of a boy pushed to the edge of endurance. These moments of horror are interspersed throughout Black Feathers , growing more extreme as the book builds to its climax. The parts of Black Feathers that are not detailed portraits of human suffering are oddly reserved. From a Fletcherian obsession with chewing to an implication that beauty cannot coexist with evil, D'Lacey has written Black Feathers with a Victorian, almost Aristotelian, esthetic. His men are gruff, fiery, and natural leaders, while women are soft, tearful, nurturing followers. Men who fall short of this ideal are pederasts and suicides. Gordon's most tenacious antagonist is the picture of an Aristotelian "failed man," with "a soft, fat hand, pale and well-manicured" (p. 182), "chubby breasts instead of pectorals" (p. 184), and a "feminine," "castrato" voice (p. 140), in addition to a sadistic sexual interest in the men around him. A woman literally cools Gordon's fever after his passage through the underworld—and elicits an understandable reaction from a fourteen-year-old boy interacting with a girl who is not one of his sisters for what is, as far as the reader is concerned, the first time. It is difficult to understand either Megan or Gordon as independent people, because they have no peers. Gordon admits in his diary that he has no friends at school and no real interests—not sports, not academics, nothing on television or the internet. Despite being wealthy, he owns neither a phone nor a computer (illustrating one of the difficulties with writing near-future fiction; a rich teen without a phone could have gone from ordinary to odd in the time it took Black Feathers to see print). Megan mentions her friends, but we see her only in the company of Mr. Keeper, the village wise man. Both of the teenage protagonists in Black Feathers are shown either alone, or under adult supervision. While not necessarily unrealistic, it gives the book a didactic tone that distanced me from the characters. Black Feathers owes a great deal to the British cozy catastrophe novels of years past. Even during the upheavals of Gordon's time, the park-like English countryside can provide so much food that a former investment banker has no trouble keeping himself and two teenagers happily fed with nothing but a trap line and an air rifle. In Megan's time, Mr. Keeper tells her that "You mustn't [imagine things about me]. And you mustn't imagine where this walk will take us either. . . . Don't imagine that danger lurks around every corner" (p. 209). The two travelers from the future have no fear of the bandits, storms, or wild animals. At one point, they look out over the empty ruins of a city. Imagining the millions (and perhaps billions) of people who died makes them sad, but they seem to believe that it was ultimately for the best. I have plenty of logistical nits to pick with this book, from Mr. Keeper's endless supply of post-apocalyptic British pipe tobacco to Megan the farm girl's unfamiliarity with branding irons and hats. However, none of these things would matter if the book either acknowledged its strangeness or held my interest with its plot and its characters. Where Mr. Keeper gets his matches is not as important as the fact that I was left to dwell on trivia while he delivered another speech on the importance of Gordon's story. I had high hopes for Black Feathers . Birds of all kinds are dear to my heart, and I was excited to read a book by a man who appreciates the beauty, intelligence, and variety of British corvids. D'Lacey has obviously spent time around crows and knows how to write them, from the cheerfully rapacious magpies who lead Gordon along his path, to Megan's time among the laughing shadow clan of crows. Unfortunately, I found very little else in Black Feathers that appealed to me. The most vivid moments in the book were acts of extreme brutality. These might have worked well in a horror novel, but they felt out of place next to passages about quiet contemplation and oneness with the Earth. The book told me over and over again how the fate of the whole world hinged on Gordon and Megan, without letting me see them do anything that felt earthshaking. I think that it is easy to forget, in some places and times, the scale on which humans are capable of engineering their environment. I live in the American Midwest, a landscape maintained for thousands of years by people with fire. This was the site of what may have been the biggest anthropogenic ecological disaster in history, the Dust Bowl, in which animals and people strangled on clouds of topsoil that blew all the way to New York City. In response, we planted over two hundred and twenty million trees—or three trees for each person in Great Britain today. My home is still in danger of being turned into a North American Sahara, a vision far more terrifying than a few square miles of dead land in the middle of a former British city. Our world, which is supposed to be reflected in Gordon Black's world, has already experienced ecological disasters on a scale far beyond anything imagined in Black Feathers , and the challenges that may be in our future look like they are going to be worse still. None of the descriptions of the gray, tired countryside in Black Feathers frightened me as much as the stories I have heard from people who have breathed the air in Beijing, and no natural disaster imagined in Black Feathers equals the devastation that people have suffered from disasters like the Boxing Day Tsunami. Despite all of its talk about living in harmony with the Earth and the consequences of throwing an ecosystem out of balance, by far the greatest source of terror in Black Feathers comes from acts of brutality between individual human beings. Even in Megan's more enlightened era, places where the unwashed masses gather are shown as cesspools of fear and immorality. There is little room for friendship in this book. When strangers meet, they circle each other like feral dogs, sniffing for weakness. Black Feathers is supposed to take place in our world, but it is not a world that I recognize. When it comes to human brutality, Black Feathers goes too far. When it comes to environmental disasters, it does not go far enough. At no point was I convinced that the fate of the entire Earth hinged on one fourteen-year-old boy in England—something that ought to be an easy leap for an experienced fantasy reader to make. 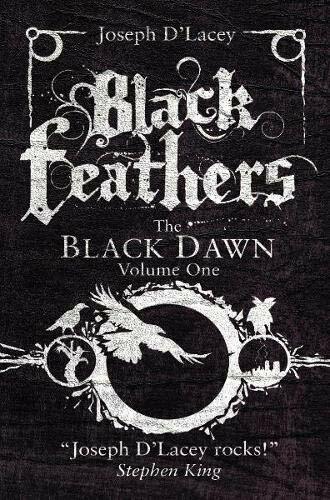 Black Feathers will have a sequel, so the ultimate mystery of the Crowman and what, exactly, Gordon's relationship to that dark creature might be is not resolved in the first book. Despite my lingering curiosity about these questions, I will not be picking up the next book. I will be spending my time in fantasy worlds that I can believe in, where people are capable of the decency that I see around me every day. As a child, Sarah Frost wanted to write a post-apocalyptic science fiction epic poem. The great-grandchild of that ill-fated attempt became her first published work of short fiction in Analog in 2011. She is a hopeless podcast addict, a lover of birds, and a science fangirl. She lives in Kansas with a cop, and blogs at http://www.sarah-frost.com.